An ice age strikes a chain of islands, and thousands come to seek sanctuary at the gates of Villjamur: a city of ancient spires and bridges, a place where banshees wail the deceased, cultists use forgotten technology for their own gain and where, further out, the dead have been seen walking across the tundra. When the Emperor commits suicide, his elder daughter, Rika, is brought home to lead the Jamur Empire, but the sinister Chancellor plans to get rid of her and claim the throne for himself. Meanwhile a senior investigator in the city inquisition must solve the high-profile and savage murder of a city politician, whilst battling evils within his own life, and a handsome and serial womanizer manipulates his way into the imperial residence with a hidden agenda. When reports are received that tens of thousands of citizens are dying in a bizarre genocide on the northern islands of the Empire, members of the elite Night Guard are sent to investigate. It seems that, in this land under a red sun, the long winter is bringing more than just snow . . .
Mark Charan Newton made his debut last year with the stand-alone fantasy novel, “The Reef”, published by Pendragon Press. Now he publishes the debut novel in his first fantasy series, “Legends of the Red Sun”, “Nights of Villjamur”. As the name of the novel says the majority of its action takes place into the city of Villjamur, the capital of the Jamur Empire, a city and an empire that face an upcoming prophesized ice age. I’ll admit from the start that I fell in love with the city created by Mark Newton and I find Villjamur to be a vibrant and vivid city. Every description and any action scenes, that catch glimpses of Villjamur breathe life into this city, put brick upon brick in the construction of a very realistic urban settlement. What impressed me even more is that Villjamur is not just a postcard, but is a moving picture, with almost every sense of the reader involved in its images. Every image of the city involves noises, smells, movements, in one word life, and I believe that in an effort of imagination and meeting certain conditions Villjamur would have been a real city. In this setting the characters and the events surrounding them will develop. The story follows a set of characters, coming from a wide range of backgrounds and moving in almost every step of the social ladder of the Jamur Empire. As the empire is not inhabited only by humans, so the set of characters involves a non-human one, a rumel investigator from the Inquisition, Rumex Jeryd. I find this character together with the commander Brynd Lathraea to be the most appealing. I find these two characters to involve a greater panoply of emotions, each one with a story that I consider to be the most interesting in the wider picture of the novel. I’ll add here the story of Dartun Súr, one that for me was as captivating as the others, although a little underdeveloped compared with the others. However, when an author engages with so many characters and stories it is easy for some of them to be stronger than the others. So is the case of “Nights of Villjamur” and Mark Newton seems to forget in some places about some of his characters storylines. There is a question of rhythm here as well, at least for me. Like I said the novel follows a set of characters and their storylines, but on some occasions I surprised myself wonder where are some of the characters, because their stories are forgotten for a few chapters and fall out of the reader’s focus until they pop out in front once again. Coming to this matter I find one storyline to be hasted, without a proper attention given to the relationship between Randur and Eir. I’ll be honest until the end and admit that these two characters fell a little on the wrong side with me. I find Randur a bit stereotypical as character and I felt most of the time that his relationship with Eir is unnatural. And Eir jumps too easily over a few of Randur’s issues and each one of them jumps way too easily in the other’s help, considering their situations. But despite these issues I believe that Mark Newton manages to balance his characters. I mean that although I liked some characters more than others and I was interested more in their stories, I believe that the author manages to avoid the flat characters. Each one of them doesn’t have an in-depth characterization, but they are not shallow either, and considering that this is the first novel in a series there is a lot of room for them to develop further on. The start they made is good. 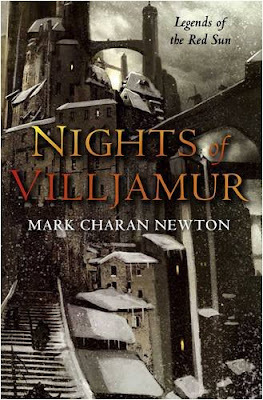 There are other elements of “Nights of Villjamur” that have room for development and I have hopes that Mark Charan Newton will develop them. I refer here to Jurro the Dawnir, a sole represent of an ancient species and who reminded me a lot of Loial the Ogier from “The Wheel of Time” series with his love for books and wish to travel, the Night Guard, a troupe of elite soldiers, and the Ovinists, a secret and illegal religious cult. I was caught in the spell of “Nights of Villjamur” but the end of the novel didn’t bring my release and I was left wondering about the outcome of its story. Mark Charan Newton shows in his novel a great potential, for him as a writer and for his fantasy series, “Legends of the Red Sun”, and I believe that he can sit without question in the hall of the new names of epic fantasy writers and bring his contribution to a great new generation of such authors. A fine review, Mihai!! I´ve got the book with me for some time now but I have other books to review first. Now I´m going to have to advance it in the queue! ; I´m very curious! Thank you! I highly recommend Mark Newton's novel. And for me I have to squeeze his debut novel "The Reef" into my readings soon. Just ordered this one from the Bookdepository, thanks for the review... Looks like theres a lot to look forward to in this book. Mihai, a great review! Well done! I know what I speak about because I read the book. Anyway I hope want don't have to wait too long for the sequel.